Achieving health care that is safe, timely, effective, efficient, equitable, and patient-centered (STEEEP) is not an endpoint, but a journey. This journey requires a commitment to quality improvement (QI) from the highest levels of leadership combined with the interdependent development of several key components of health care delivery: administration and governance, clinical leadership, quality programs and expertise, data analytics, and accreditation. As each organization travels along its journey, these components must evolve at a common pace. 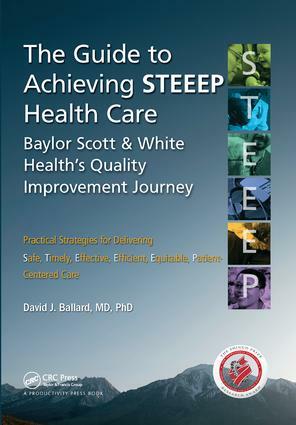 With each component of a given phase of the quality journey firmly developed, the organization can expect to advance to the next phase knowing that the requisite factors are aligned.Winner of a 2015 Shingo Research and Professional Publication AwardBaylor Scott and White Health (BSWH) has formalized its commitment to quality with the adoption of the STEEEP framework supporting the Institute of Medicine's call for health care that is safe, timely, effective, efficient, equitable, and patient centered. This Shingo Prize-winning guide book is a companion to BSWH's recent book Achieving STEEEP Health Care. It presents practical approaches and tools, including sample workflows, forms, charters, and checklists, that health care delivery organizations can use to organize, lead, execute, and measure the impact of their own improvement efforts.BSWH has traveled the QI journey during its 100 years as the largest not-for-profit health care system in Texas and one of the largest in the U.S. With a history of visionary care, its aim is to help others achieve the highest levels of quality and safety for their patients. To learn more about the BSWH quality journey and to find additional case studies and tools, please visit www.steeepglobalinstitute.com.